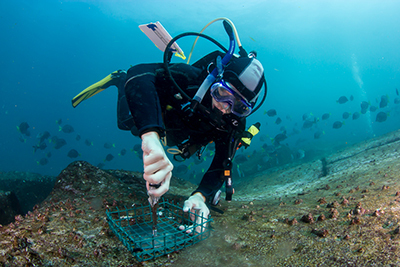 Robert Lamb's research in the Galápagos Islands focuses on how the sea urchin and fish herbivores affect the subtidal-reef ecosystem.Graduate training is centered in the academic program, and interdisciplinary inquiry is encouraged. The director of graduate study and other faculty mentors are important guides for students. Other offices provide resources to further your research, teaching, and other professional development. You can learn about the culture by looking at the rules and regulations section, which includes the Academic Code and the Graduate School Handbook. These policies, procedures and practices guide graduate education at Brown. The Graduate School deans and staff are available to assist graduate students and postdoctoral appointees. The associate dean for academic affairs is the primary contact for academic matters. Master's students should feel free to call on the associate dean for master's education. Associate deans for professional and student development are available to meet with students, as well. Students and postdocs may also visit the dean of the Graduate School during weekly office hours. Brown University typically awards more than 200 doctor of philosophy degrees each year. The Brown Ph.D. is primarily a research degree. The Brown Graduate School awards master's degrees in the listed programs as terminal degrees or during ordinary progress toward a Ph.D.